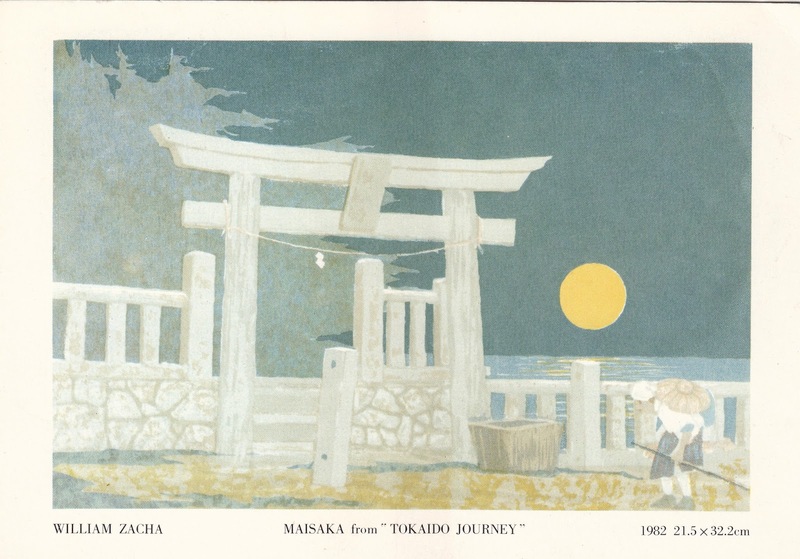 One Postcard a Day: Maisaka from "Tokaido Journey"
Postcard US-4002386 to China shows the sun over a torii (鳥居) on a 21.5cm x 32.2cm serigraph painting Maisaka from "Tokaido Journey" by William Zacha in 1982. An entry from Wikipedia explains that a torii, which literally means bird abode, "is a traditional Japanese gate most commonly found at the entrance of or within a Shinto shrine, where it symbolically marks the transition from the profane to the sacred." They are a common sight at Japanese Buddhist temples as well. Merged into the city of Hamamatsu in 2005, Maisaka (舞阪町) was a fishing town on the Pacific coast of Shizuoka Prefecture, Japan. 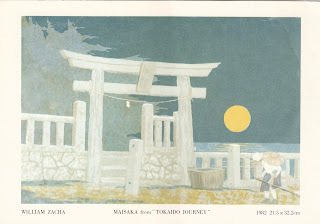 According to William Zacha, this torii is at the departure point for ferrying across the narrow stretch of water that connects Lake Hamana (浜名湖) with the ocean. It's a great fishing area, famous for eel.